The hotel offers a restaurant. Public areas are equipped with complimentary wired and wireless Internet access. This business-friendly hotel also offers a sauna, spa services, and multilingual staff. Parking is available onsite for a surcharge. Located in Sapporo City Centre, this hotel is within a 10-minute walk of Sapporo Tanukikoji Shopping Street and Odori Park. Nijo Market and Former Hokkaido Government Office Building are also within 15 minutes. Susukino Station is 6 minutes by foot and Odori Station is 9 minutes. Along with a restaurant, this hotel has a sauna and self parking. WiFi in public areas is free. 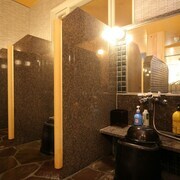 Additionally, spa services, a 24-hour front desk, and multilingual staff are onsite. All 134 rooms offer free WiFi, refrigerators, and TVs. Guests will also find pillow menus, hair dryers, and desks. 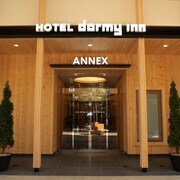 Dormy Inn Sapporo Annex Hot Spring offers 134 air-conditioned accommodations with hair dryers. A pillow menu is available. Televisions come with pay movies. Guests can surf the web using the complimentary wireless Internet access. Cooked-to-order breakfasts are available for a surcharge and are served each morning between 6:30 AM and 10:00 AM.